A plan to swap tangerines for solar power on Jeju has so far proven popular among the island's citrus farmers. According to a report by Korea Bizwire, 164 farmers have applied to a new scheme, launched by Jeju Special Self Governing Province on July 11, to turn citrus farms into land for renewable energy supply. A total of 1.2 million square meters of land has been registered for solar power production. This would generate an expected 80.7 MW of electricity, the report says, far exceeding the Province's early expectations. In line with its carbon-free 2030 goal, The Provincial Government aims to have 5.1 million square meters of land marked for the renewable energy source over the next 13 years. This will bring in an aggregate power output of 340 MW. 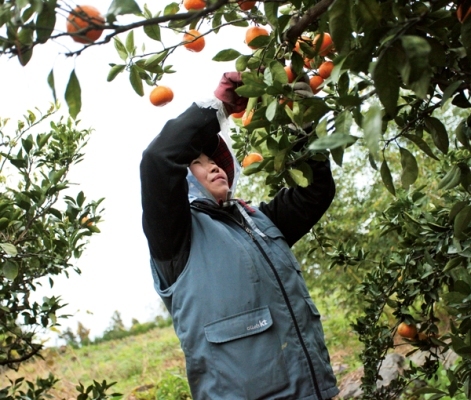 Jeju has about 22,000 citrus farms producing the island's much loved tangerines. It is hoped the scheme, which offers a 20-year guaranteed fixed income, will prove very attractive to farmers. By gathering the sun's rays and selling the generated electricity, farmers on an average-sized farm could receive 4,000 won profits per square meter of land, says Jeju Provincial Government. This is a little more than three times the profit they would receive from picking tangerines. The Provincial Government says the scheme will reduce labour costs and tackle the problem of overproduction of tangerines, many of which go unharvested due to a shortage of farm workers willing or able to pick them. Further, it will help the island achieve its 2030 carbon-free target and bring a guaranteed income to many of the island's residents, the local authority said. Once land has been finalised for the operation, construction on the solar power facilities is expected to begin immediately in time for a 2017 start. Contracts for successful applicants will be signed after companies have been recruited and electricity pricing is agreed. Successful bidders will need to cover expenses and guarantee net profits of at least 50 million won for the next 20 years for a 1 MW power plant. Engineering Procurement Construction firms along with financial institutions and local companies will jointly oversee operations on power plants.